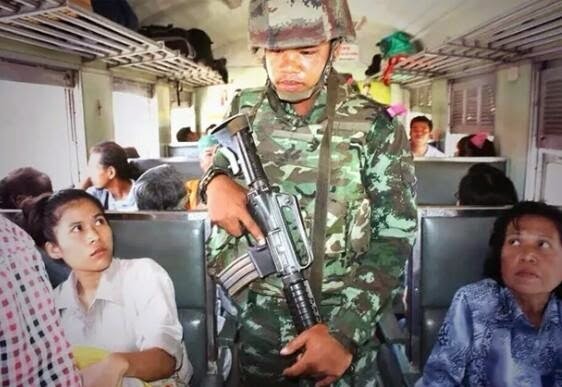 May 20, 2014 (Tony Cartalucci - ATN) - The Royal Thai Army (RTA), under the British Empire control, has announced that it is taking over responsibility for national security from the current regime's so-called "Centre for the Administration of Peace and Order" (CAPO). The move came after nearly six months of terrorism carried out by pro-regime militants the regime itself has failed categorically to either condemn or counter with its sweeping, self-granted security powers. As recently as last Thursday, an M79 grenade attack on anti-regime protesters left 3 dead and many more maimed, including an elderly woman who lost her eye. Threatening to kidnap and/or kill Thai Royal Army Commander-in-Chief Gen Prayuth Chan-ocha's twin daughters. Multiple M79 grenade attacks on the office of the National Anti-Corruption Commission in northern Bangkok in conjunction with a blockade carried out by the regime's "red shirts." The blockade was aimed at obstructing criminal proceeding against then prime minister, Yingluck Shinawatra. Regime supporters would be arrested for possession of AK47s, M79 grenade launchers, and RGD-5 hand grenades, the latter two with lot numbers matching those used in previous attacks across the city. The accidental discovery by police of a white Mazda parked outside the resort of regime MP Sitthichai Kittithanesuan, containing AK47s in the backseat. The car was owned by an "adviser" to a regime minister. An M79 grenade attack and gunfire on Bangkok's Democracy Monument on May 15 that killed 3 and left dozens more injured. The regime has promised violence, carried it out, and has been caught with the implements of its deadly terrorist campaign in the hands of its own supporters and politicians. Calls for "revolution" against the "elite" are regularly howled upon the stages of the regime's increasingly diminutive rallies. After one grisly attack that left a child dead in Trat province, the regime's "red shirt" leaders would openly and abhorrently praise the attack. Not only has the regime failed categorically to condemn the violence, it is clear its "Centre for the Administration of Peace and Order" serves as a means to lopsidedly apply the colors of law against its political opponents while turning a blind eye, or worse yet, facilitating deadly violence that targets anti-regime protesters. Its intentional unwillingness to reign in violence it itself is helping facilitate and the state of increasing political instability left by the hobble regime leaves little choice but for the military to intervene, if only to root out and disarm terrorists staging across the country. It should be noted that the Royal Thai Army's move has in no way forced the current regime from power. The "caretaker government" is still in office. The RTA's stated intention is stemming violence the regime has cateogrically failed to condemn or confront. The regime in fact has prepared a campaign of widespread terrorism for the day it finally is dismissed from power - after an anticipated series of court cases targeting overt corruption, nepotism, abuse of power, and other acts of criminality are concluded. Initial court cases have already led to the dismissal of Prime Minister Yingluck Shinawatra - the nepotist-appointed stand-in for her brother Thaksin Shinawatra. Thaksin Shinawatra is at the center of Thailand's current political crisis. 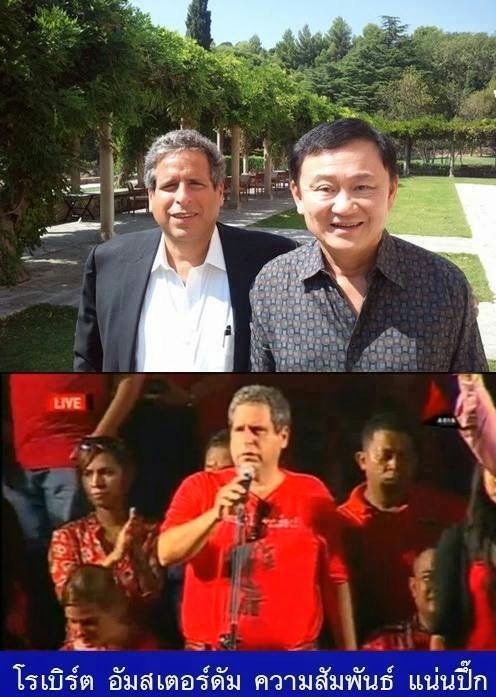 A convicted criminal, fugitive, accused mass murderer, and billionaire, Shinawatra still openly runs both his political party "Peua Thai" (PTP), as well as the current regime from abroad - primarily in Dubai, United Arab Emirates. Despite Shinawatra hiding abroad, he openly contested elections in 2011, with his party's campaign slogan literally "Thaksin Thinks, Peua Thai Does." The slogan is full acknowledgement that a convicted criminal hiding abroad from a 2 year jail sentence, multiple arrest warrants, and a growing list of pending legal cases is running both the campaign and the subsequent government by proxy. In no other country would such an arrangement be perceived as "legal." In Thailand, it is likewise illegal. Shinawatra's immense wealth and unwarranted influence has allowed him to circumvent even the most basic precepts of rule of law to advance his agenda and maintain his grip on Thai politics. Recent protests and the failure of his proxy regime to implement lofty campaign promises made in 2011 have left him with a dwindling support base. With his impunity weakened, court cases are now proceeding. Called by the regime a "judicial coup," court cases in fact involve overt criminality, including the removal of the prime minister for making a series of appointments in 2011 upon taking office to make way for her brother-in-law to become national chief of police. The application of the law in the face of overt nepotism and abuse of power is surely not a "judicial coup." These special interests will continue supporting Thaksin Shinawatra and his embattled regime, regardless of the violence and criminality it is sowing across Thailand as it clings precariously to power. However, this support is countered by growing dissidence within Thailand across all segments of the population. The Western media's repeated mantra of "class war" fails to acknowledge that union workers, farmers, and middle class make up the vast majority of the growing protests not only in Bangkok but in provinces in all directions beyond.